The property owner must come in person to the 7th floor of 1136 Washington St. Fill out the New Water and/or Sewer Service Agreement (Sample Agreement). Provide the tax map number and property address. Make payment for the new water meter and/or sewer tap at the time of application. See the schedule of Water Tap/ Meter Fees, Main Line Tap Fees and Sanitary Sewer Tap Fees. If the owner cannot come in person, they must designate a representative to come in on their behalf and complete the Special Power of Attorney Form following the instructions of that form. The property owner must contact the Planning Department prior to coming in person to the 7th floor of 1136 Washington St. Submit a copy of the recorded deed and plat to the Planning Department. Complete a petition for annexation with the City’s Planning Department. Visit the Planning Department’s Annexation Page for more information. You can also contact the Planning Department staff at +1 (803) 545-3222 if you have any questions about petitioning to be annexed. Once the petition for annexation is applied for, fill out the New Water and/or Sewer Service Agreement (Sample Agreement). Prior to applying, the owner must provide a copy of the current recorded deed. Fill out the Fire Hydrant Permit Application (Sample Agreement). Make payment for the new water meter and/or sewer tap at the time of application. See the schedule of Fire Hydrant Fees. If you need to have a pressure test, you can submit a Design Water Pressure Request and a required $175.00 payment. This is considered an excavation in a city or state right-of-way to provide a new service to a property and may require special permits. The Water Division estimates 6-8 weeks for this type of installation after application for service has been made. Review property, obtain/submit all encroachments. This is considered as a service line connection with meter box visible and prepared for meter installation. The Water Division recommends 21 workdays for this type of installation after application for service is made. When installing meters, which have stub-outs/taps, it is crucial that developers, owners, contractors, etc. locate the stub-outs/taps (meter box). When existing stub-outs/taps are not visible, it may be necessary to pay an additional fee for a stub-out/tap to be made. This also may require an encroachment permit and take approximately 6-8 weeks. Permit A permit is an authorization to work on state or local right-of-way for excavation purposes. Permits from state and county generally require 2-4 weeks for processing. Stub-out A water service that has been previously installed at the property line, consisting of a valve in a meter box. Main Line Tap A connection to an existing water main that requires excavation in the road right-of-way or possibly boring under or digging across a roadway. Locate State law requires all excavators/operators to call SC811 72 hours before any excavation. This notifies all utility companies of the intent to dig in case they have underground lines in the area, such as telephone, electric, gas, etc. Fees: Schedule of fees for basic services. 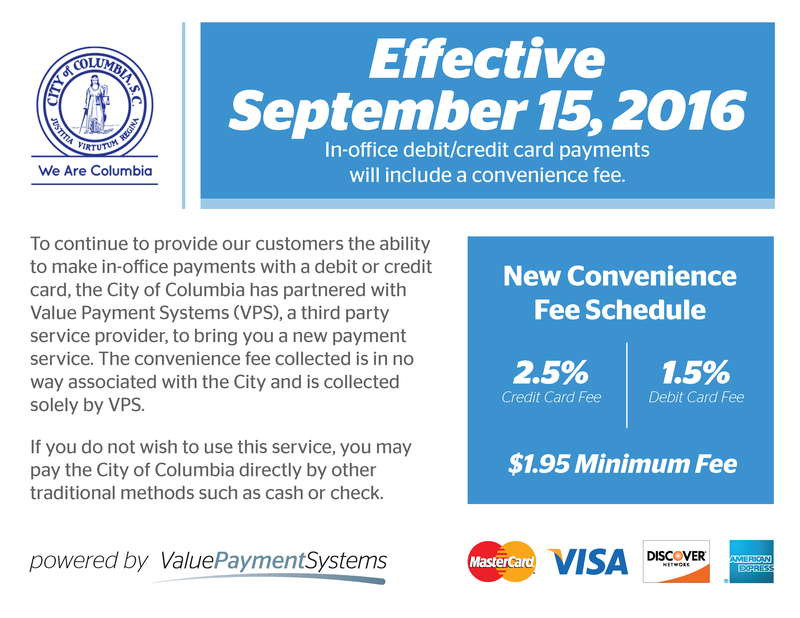 Credit card processing will incur additional fees.